Deputy chief of Iran's Revolutionary Guards warns Europe against trying to halt Iran's missile development. The deputy chief of Iran's Revolutionary Guards has warned Europe against forcing the Islamic Republic into boosting the range of its missiles by trying to halt their development, AFP reports. 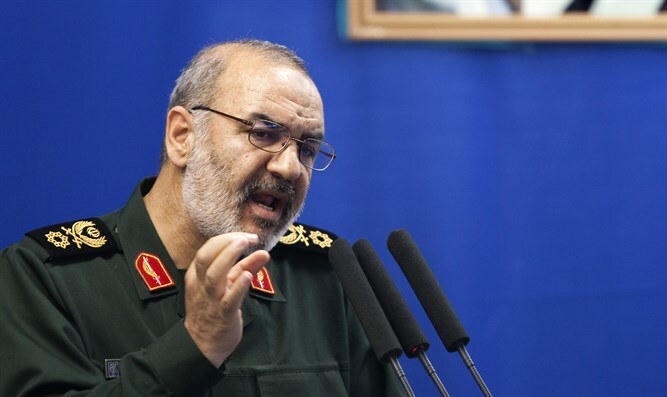 "If the Europeans, or anyone else, want to conspire to disarm Iran of missiles, we will be forced to make a strategic leap," the guards' deputy commander Brigadier-General Hossein Salami was quoted as having said on state TV on Saturday. The warning came days after Britain, France and Germany launched a trade mechanism that would bypass US sanctions on Iran that were reimposed after President Donald Trump quit the 2015 nuclear deal last week. The nuclear deal did not, however, deal with Iran’s ballistic missiles program, which was one of the reasons Trump quit the accord. Salami’s comments also came after Iran announced the "successful test" of a new cruise missile with a range of over 1,350 kilometers, coinciding with the anniversary of the country's 1979 Islamic Revolution. Iran has voluntarily limited the range of its missiles to 2,000 kilometers (1,250 miles), but that is still enough to hit Israel and US bases in the Middle East. Washington and its allies have accused Tehran of pursuing enhanced missile capabilities that also threaten Europe and have said that its ongoing missile tests are in defiance of UN Security Council Resolution 2231, which enshrined Iran’s 2015 nuclear deal with Britain, China, France, Germany, Russia and the United States. Iran, however, denies its ballistic missile tests violate this resolution. President Hassan Rouhani has stressed in the past that Iran will continue to produce missiles for its defense and does not consider that a violation of international agreements. Salami on Saturday warned world powers "not to seek (new) negotiations or make recommendations or requests on Iran's missile power". "Our enemies only understand the language of force. If you cannot talk to them in that language, they will use it to talk to you," he said, according to AFP.